There's a lot riding on your spinal column. It's your body's main structural support. It needs to keep you stable enough to stand upright but flexible enough for movement. So it's no surprise that many people have back problems from time to time. The hurt can stem from sore muscles, ligaments, and tendons, or from herniated disks, fractures, and other problems in your upper, middle, and lower back. Sometimes you feel the effects right away. But in many cases, back problems develop over time. The spine is actually a stack of 24 bones called vertebrae. 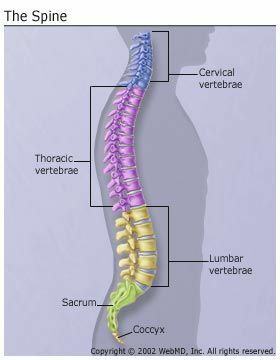 A healthy spine is S-shaped when viewed from the side. It curves back at your shoulders and inward at your neck and small of your back. It houses and protects your spinal cord, the network of nerves that transmit feeling and control movement throughout your entire body. One of the more common types of back pain comes from straining the bands of muscles surrounding the spine. It happens most often in the curve of the low back and the base of the neck. These areas support more weight than your upper and mid back, which are less prone to trouble. Injuries from contact sports, accidents, and falls can cause problems ranging from minor muscle strains, to herniated disks, to fractures that damage to the spinal column or cord. Stabbing low back pain could be from muscle spasms, when your muscles seize up and don't relax, like a cramp. Osteoarthritis can affect your vertebrae, when the cartilage between them wears down. Bone spurs or a herniated disk can push on nerves. Pregnancy often brings on back pain, too. Hormonal changes and weight gain put new kinds of stresses on a pregnant woman's spine and legs. Sometimes your back might be sore for no clear reason. That's called nonspecific backache. It could come from weak muscles that can't handle everyday walking, bending, and stretching. Uncontrolled peeing or pooping could mean a serious problem like spinal cord compression. Call your doctor right away. During your exam, your doctor will test your range of motion -- unless you can't move -- and check how well your nerves are working. That may be enough to decide what to do next. You might need imaging tests, like X-rays, an MRI, or a CT scan. But they're not always useful, and there's not always a direct link between the results of these tests and how much it hurts. Your specific treatment will depend on what's causing your pain and where in your back it is. Despite what you may think or have been told before, staying in bed isn't usually the answer; gentle exercise is. It will help work out the kinks, build support for your spine, and improve your flexibility. A physical therapist can work with you to design a set of exercises, give you relief from the pain, and get you moving again. Over-the-counter pain relievers, ice, and heat will work to take the edge off most back pain. Your doctor can prescribe stronger medicines, but some can make you drowsy or dependent on them if you're not careful. Complementary therapies, such as chiropractic spinal manipulation, acupuncture, and massage, can help ease pain, too. If a bone is damaged, or you have a herniated disk or pinched nerve, you may need surgery. But for ongoing back pain, doctors will try other treatments first. Counseling could help you learn to live with chronic pain better as well as deal with symptoms of depression because of it. Exercise! Strengthening the muscles around your spine and in your core will help keep you stable and balanced. Walking is great for your low back, and it's simple to do. Practice good posture. As a rule of thumb, aim to keep your ears, shoulders, and hips aligned when you sit, stand, and walk. Lift heavy things correctly, using your hips and knees for power while keeping your back straight. Try sleeping on your side, with a medium-firm mattress. Don't smoke. It restricts blood flow, so your muscles and tissues don't get a good supply of nutrients and oxygen. That can lead to weakness and aches. Repeated coughing could strain your back. Oh, W. The Clinical Journal of Pain, January/February 2004. Friedman, F. Outwitting Back Pain: Why Your Lower Back Hurts and How to Make It Stop, Lyons Press, 2004. Mayo Clinic: "Back pain: Symptoms."